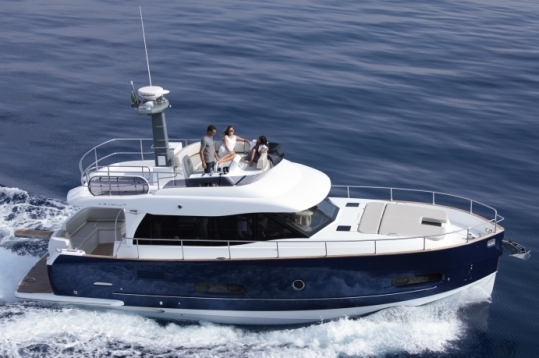 Preceded by the innovative scope of the 74, and the commercial success of the 50, the new 43 is the newest addition to the Magellano collection by Azimut. Within thirteen meters is a concentration of all of the features of the explorer series from Azimut the Magellano: smooth navigation in all conditions, excellent cruising range in a modern and an Italian modern take on the traditional trawler. Designed like 50 by Cor D.Rover the 43 Magellano is a very intelligent boat which inspires safety with modern design features. Astern galley in the main deck serving comfortably inside and the outside aft cockpit is one of my preferred features. Down below is a two or three cabins layout served by two shower heads, with owners cabin to fore. The third cabin is a single berth option or to starboard, which also be used an utility room. The flybridge of the 43 Magellano is also quite spacios offering a C-shaped dinette to port with helm opposite, with a free area to stern. Power is Cummins engines; 305 or 355hp giving max speeds of 22 knots.